Forget men, when did dealing with skin start being so goddamned difficult? I’m not sure how it started (although I have a sneaking suspicion that it may have been my Clinique Moisture Overnight Mask that originally triggered it) but my skin is rebelling and having bad skin day after bad skin day. It’s a landslide. On good days my skin is happy, and on bad days it is angry, and these days, it is furious, presenting me with a combination of massive whiteheads and stubborn red spots that just won’t go away. The cause remains unknown to me. It could be any number of things including my use of the Clinique Moisture Overnight Mask, my change from Shu’s blue Hydrability range to the red Red:Juvenus range, or simply the change of season from winter to summer and the increasing humidity. I doubt that stress and diet are the perpetrators, but I suppose one must never rule things out. If it is the Red:Juvenus for early signs of ageing range, that makes me very sad. Does that mean that I will never be able to use anti-wrinkle creams, or worse, that I have to choose between pimples and wrinkles? Destined to be old and wrinkly or old and pimply, there’s a cheerful thought for you. Anyway, as I was at my wit’s end, I wanted a product that would combat blemishes effectively while being gentle on my sensitive skin. It’s not a very easy combination to come by when zapping zits. After trawling through what seems like hundreds of beauty blogs in the blogosphere, happenstance would have it that I discovered the Australian brand called Aesop, courtesy of a friend. Having looked through their products and read review upon review, I decided to find my nearest counter (luckily for me, Aesop do have counters in Japan) and get some samples. 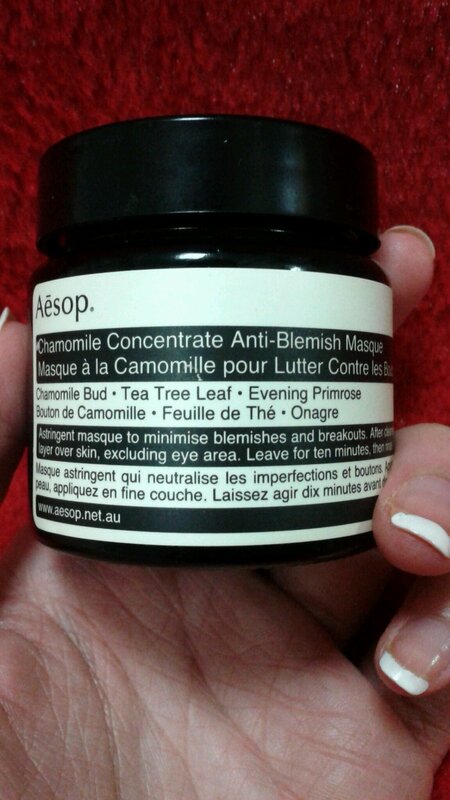 The two products that piqued my interest were the Chamomile Concentrate Anti-Blemish Masque and the Control gel. As the latter had no samples available, I picked up a couple of packets of the former to use over a few days. Come bedtime, desperation had me ripping open the packet in a frenzy. The mad woman in the attic had nothing on me at that point. I applied it thickly over each individual spot (I don’t think that’s how you’re supposed to use it, but hey) and waited for a short while before retiring into the arms of Morpheus. The next morning, while the spots had not vanished (I don’t think there is any product in the world that can do that), they were definitely smaller and less red. 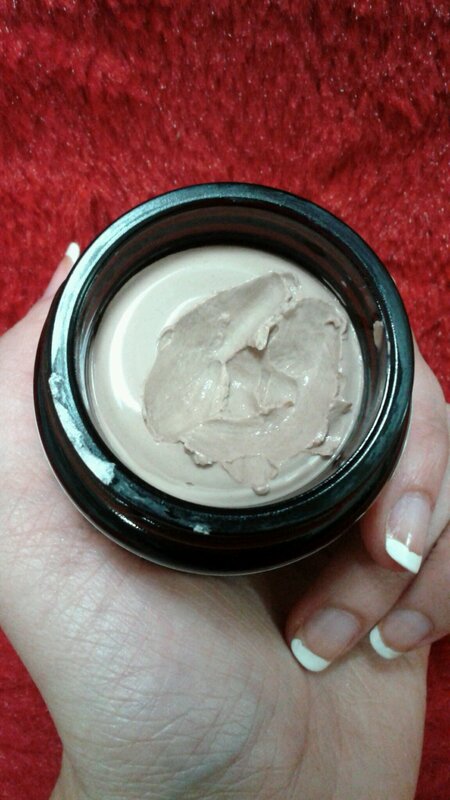 I have used this masque in this way over the past few weeks, having liked the sample so much I purchased the full sized pot. All spots, I have discovered, are not created equal. It does work better on some rather than others, but I find it does generally soothe the skin and reduce inflammation and redness, without irritating or drying out the surrounding skin. It also works on my sensitive skin, without causing reactions, which is a massive pro in my book. It smells earthy (well, I suppose it does contain clay after all). Some people might find it unappealing, but I rather like it. It feels like wet clay when it goes on and dries to a darker colour overnight. The next morning, I remove it with a cotton pad soaked in makeup remover. I will definitely be using this on all blemishes from now on. Obviously, no product is guaranteed to work the same for absolutely everybody, so to find out if it works for you, why not head to your nearest Aesop counter and try some samples? All you’ve got to lose are your pimples. One more thing that I really like about this brand is that they not only show dedication to creating products that are good for your skin (although I have tried only the Chamomile Concentrate Anti-Blemish Masque so far), but they also promote a healthy and balanced lifestyle that is supplemented by a good dose of leisurely pursuits such as literature, cinema, art and travel to name a few. It is this emphasis on personal wellbeing that makes it stand out from its competitors, and gives it that little bit of je ne sais quoi, for me at least. Their articles and A-Z City Guides make for an interesting and occasionally eye-opening read. At the risk of having passed the point of effusiveness, I leave you with the sample photos of the pimple slayer. I also don’t know why skin so difficult. And trust me it is a pain in the neck trying to get clear skin. Thank you for taking the time to read my blog and reblog my post 🙂 I appreciate it! Have you ever seen a video or blog post about the way French facialists treat skin that’s acting up? I saw a great video and blogged about it a while ago, and it’s really helped my skin!